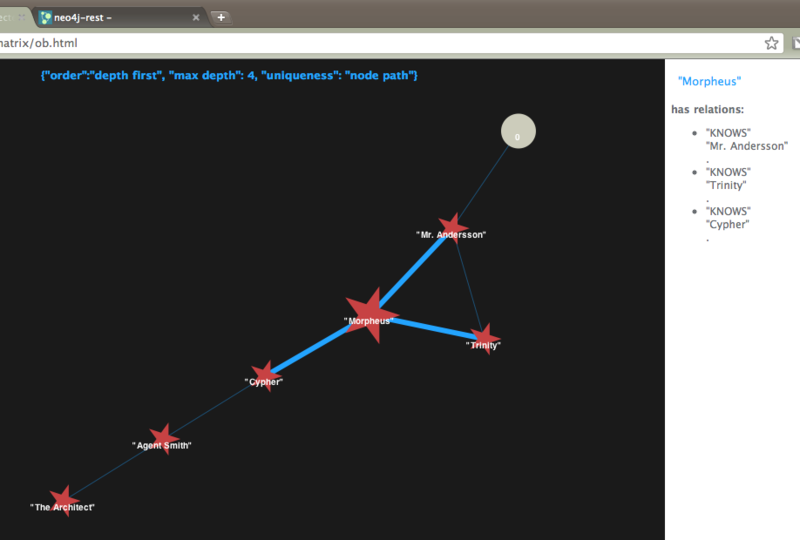 This is a Proof of Concept (from GTUG BootCamp 2010), which is: Try to code a complete client side data-load (from some REST services) and graph visualization using Neo4j REST server, the Java Script Visualization Framework JIT and Google Web Toolkit. The Neo4j REST Server – Part1: Get it going! To use JIT we have to fill a JSON object that defines the whole structure of the graph. The Graph is defined by an Array of Nodes. These Nodes itself are containing a link-between-nodes structure called adjacencies. The above example defines a Node with Id “3” and the name “Trinity”. The association is Node “3” to Node “1” (which is Neo of course) and the relation attribute “LOVES”. loadAllNodes will get all Nodes Ids to load in a Set of Strings (Set to eliminate doubles and is filled by the get traversal path method). The method clones the Set and iterates through the Nodes. loadNode is called by loadAllNodes for every Node in the Set. The method loadNode returns immediately but starts a REST call for every Node. The corresponding CallBack handler onResponseReceived are removing the loaded Node Id (fetchId). If this Set is empty, all Nodes are loaded. Method waitForLoadingNodesAndLoadRelations uses a Timer object to wait for the loading of the Nodes. It calls itself recursively till the listOfNodes Set is empty (that means all Nodes are loaded) and calls the method loadAllRelations to load the relations between the Nodes. Part 2 will cover this.